It's been a while since I posted any sweet-bake on the blog.I haven't been baking much too,just few breads and cookies,that's all.Main reason being the dreaded one-d.i.e.t.Now that I am posting a sweet bake does not mean that I am off the diet,of course;).Inspiration to bake these cookies came from my amma who saw a similar cupcake recipe on Vanitha and urged me to try it. Though I love coffee and coffee flavored desserts,I haven't really ventured into adding more coffee in my bakes,so why not make a start with this one?The cupcakes,no doubt,taste excellent(even if I say so myself)on their own but the coffee,oh the coffee,elevated it to a different level.If you like coffee,you'd sure flip on this one. 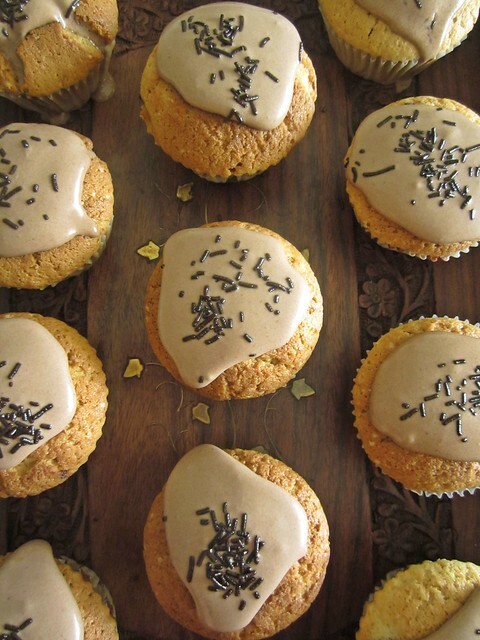 These make for a great tea-time(or coffee-time? 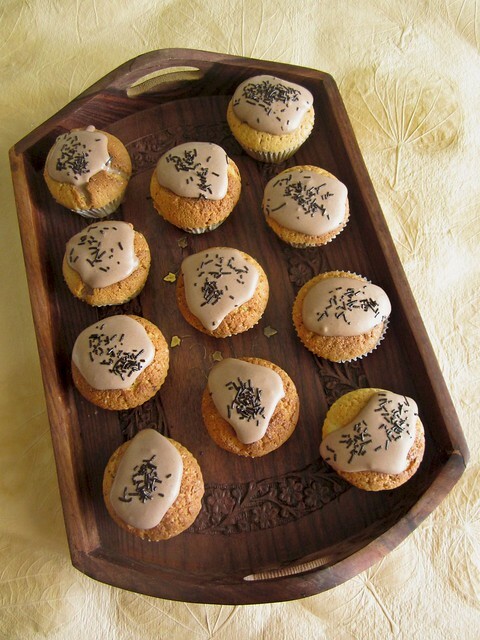 )snack and can be served plain.I had some leftover whipped cream ganache in the fridge,which refused to whip,by the way and dripped all over the cupcakes,making it moist and creamy on top.So either way,it tasted great. Preheat the oven to 190C. Line or grease the muffin pans. Sift flour,baking powder and salt 3 times. Keep aside. On low speed, beat in flour mix and milk alternatively in 3 lots. 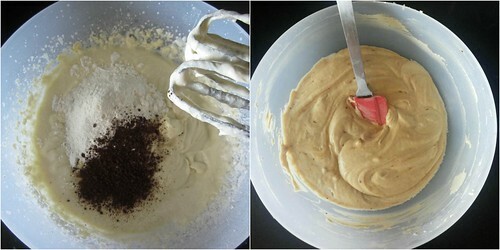 Mix in the coffee powder,do a taste test and add more if you like the coffee flavor to be stronger. Fill each muffin pan to ¾ th depth, and bake for 20-22 minutes till done. 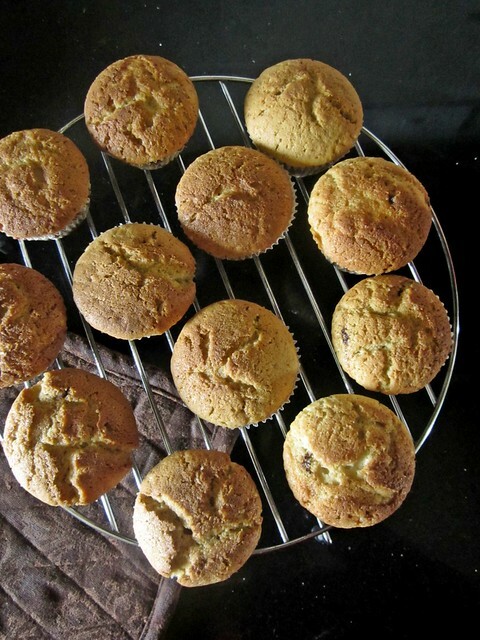 Remove from muffin pan immediately and cool on racks. The icing or rather the glaze I used is a whipped ganache,the recipe is here. I baked these cupcakes in the otg,but the top didn't brown much after baking and I wanted a golden brown top.I baked the cupcakes on Broil mode for 2 minutes and got the desired colour. Update-I accidentally added a picture from the Torcetti post among the step by step pics,sorry for the mistake.Have rectified it.Thanks Malvecka! 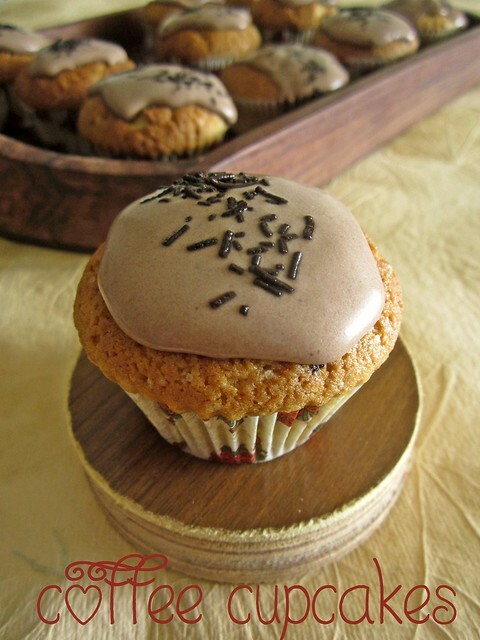 Coffee cupcake looks gorgeous and delicious. Hi Divya....the cuppies are luking very pretty....Do we have to rub in butter with flour mix; as shown in the first set of step-by-step pics? Thanks for pointing it out Malvecka,that picture was from my previous post.Extremely sorry for the glaring mistake,have edited the post now. Wow they looks damn attractive,simply irresistible and pretty tempting. 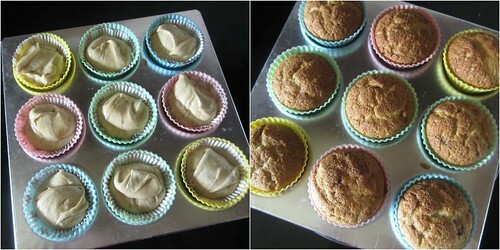 I love coffee cakes ,yours look so yummy. I love coffee cakes. 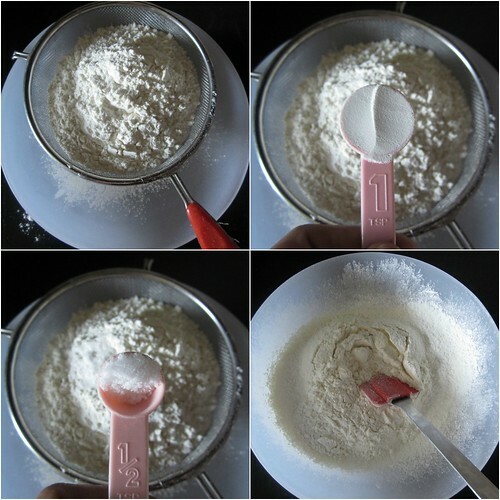 Step by step pictures are very useful. Hi! What kind of flour did you use? 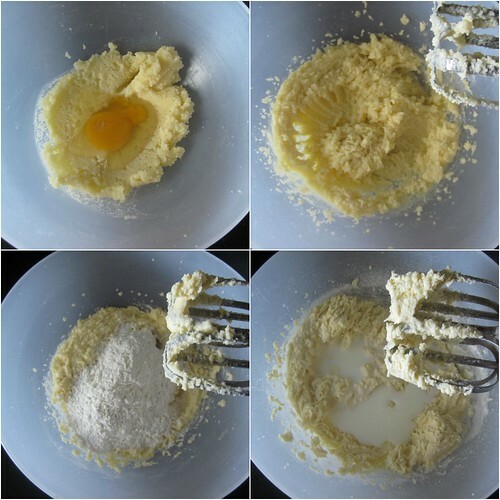 This recipe makes 18 medium cupcakes.If you want to make 6 you should halve the recipe and use slightly bigger liners which would give you 6 big cupcakes.Hope this helps. can i bake it in the oven toaster?